Crow Agency, Montana - The Civil War never came to Montana, and there are no statues of Confederate generals to argue about. But the West has its own race issues, its own lingering wounds from a war that’s just as fresh, and its own arguments over historical narratives. No site has been more central to that process of historical reckoning than here, on the low ridges and golden grasslands next to the Little Bighorn River. Ten years after the end of the Civil War, Americans were still fighting a centuries-long war over race, culture and power. Col. George Armstrong Custer was at the point of the U.S. Army’s spear, charged with rounding up the last of the free Plains Indians – mostly Sioux, Cheyenne and Arapahoe - and forcing them into reservations. On June 25, 1876, Custer ordered an attack on a large Indian encampment aside the Little Bighorn River, called Greasy Grass by the Indians. Custer and all the men under his direct command were killed in a fierce, but brief, battle. Native Americans – warriors, women and children – were killed as well, but white Americans didn’t talk much about that at the time. Nor did they question Custer’s mission or the “Manifest Destiny” philosophy that drove U.S. Indian policy, demanding indigenous people make way for Americans of European stock. Because Custer was a celebrity – he was a Civil War hero and a flamboyant self-promoter – what became known as “Custer’s Last Stand” was a national sensation. Washington’s reaction was swift and overwhelming. The 7th Cavalry avenged its losses and then some, culminating in the massacre at Wounded Knee. Lakota Chief Sitting Bull and some of his followers escaped to Canada, but eventually all who fought at Little Bighorn were confined to reservations. Indians won the battle, but federal troops won the war. Victors write the history, and they made this story all about Custer. The Army built Fort Custer near the scene of the battle, an elaborate fortress meant to send a message to all Indians. The government took the battlefield – by treaty, part of the Crow reservation – and named it “Custer Battlefield National Monument.” They built a cemetery – “Custer National Cemetery” – for soldiers from many of America’s wars. They put a stone monument on the top of the hill where Custer and his men met their end. White marble markers were placed on the spots where soldiers fell. They told Custer’s story, over and over again. Because there were no living white witnesses to his last stand, the storytellers took liberties in the telling, mostly to the detriment of the Indian warriors. Hollywood took even more liberties. More than 3,000 books have been written about the battle, rehashing the mistakes Custer and his subordinate officers made that fateful day. There were witnesses to Custer’s Last Stand – the warriors who charged the hill and some 7,000 Indians in the village below – but white historians didn’t tell their stories. They didn’t tell the story of Gall, the Hunkpapa Lakota leader whose wife and daughter were killed in the first minutes by Army bullets, fueling a ferocity that couldn’t be matched by white soldiers, whose families were safe back home. They didn’t tell the story of Crazy Horse, the Sioux warrior who charged Custer’s men only after elaborately decorating himself and his horse according to a “spirit vision” that promised protection. Forty times Cavalry troops fired at him, and 40 times they missed. His courage sparked an Indian surge that pushed Custer back up the hill. But the Indians told their stories, and, beginning a century after the battle, the rest of the world began to hear them. Eventually even Washington moved to remedy the one-sided treatment of the battle. At the urging of Sens. 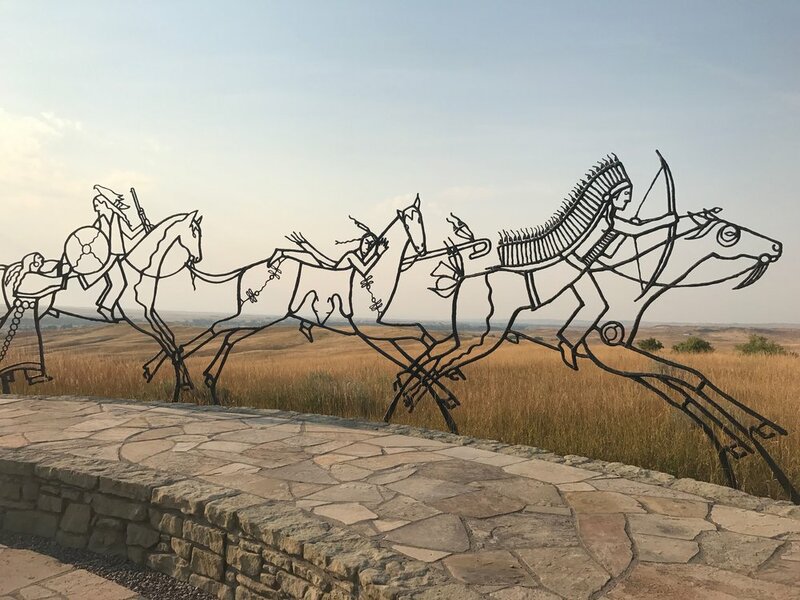 John McCain and Ben Nighthorse Campbell, a member of the Northern Cheyenne, Congress passed a law in 1991 renaming the site the Little Bighorn Battlefield National Monument. The law also ordered a monument be added to the battlefield recognizing the Native Americans who fought and died there, and a now-familiar debate ensued. One side didn’t want anything built that would detract from Custer’s story. The other wanted the Custer monument destroyed. The result is a compromise, but not a bad one. The monument to Custer’s troops retains its prominent place – it is where they fell, after all. The Indian Memorial sits off to the side. It is a stone circle with four openings, one of which, the “Spirit Gate,” frames Custer’s monument on Last Stand Hill. 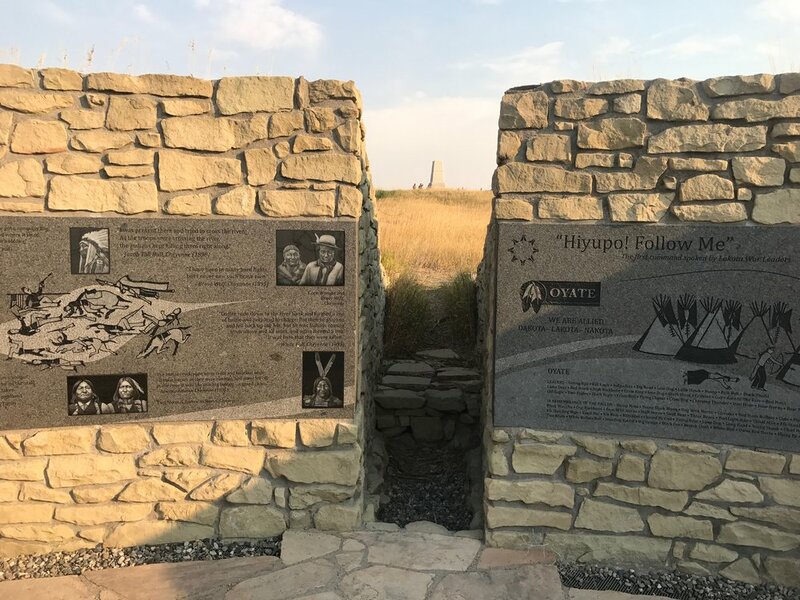 Engraved granite panels tell the stories of the five tribes the participated in the battle, including the Crow and Arikara tribes, who scouted for Custer. Three “Spirit Warriors,” outlined in bronze, ride off to battle. “Peace Through Unity,” is the official theme of the memorial, dedicated in 2003. Aimed at promoting unity among the tribes as well as between Indians and non-Native Americans, it feels a bit forced. But it has proven popular, and the battlefield has seen an increase in visitation. There are now red marble markers on the battlefield as well as white ones, marking the places where warriors were killed. As the sun set on the battlefield, I watched a Native family, parents and children, walking amid the grass and stone, taking special interest in the red marble markers. Their story was being told, and that matters. When it comes to historic markers, there’s no single answer. Some monuments mainly express values, and if those values no longer represent the community, those responsible should take them down or move them to a less prominent location. But where the subject is history, addition is usually better than subtraction. Tell everyone’s stories. Put old conflicts in context. That’s how we build empathy, get closer to the truth and to a history all Americans can embrace.